I'm sure you've heard about Liberty of London for Target by now. It erupted all over the blogosphere at the beginning of the month. I was lucky enough to snag some things before they started disappearing. I got two ruffled collar blouses, which I like but I wish the keyhole was in the back instead of the front because it sits so low on me I have to wear an undershirt, less I look completely indecent. I picked up a dress with a yellow and black floral print, which works really well for work with a black cardigan and black pumps. And there was this hat, I just can't pass up hats... Over the weekend I went to the Shelby County Master Gardener's Spring Fling at the Agricenter and bought this little thing from Little Hill Nursery. Later that day I got to visit the new Anthropologie in Germantown with some old friends and new ones. I didn't find anything to wear but I did find some pretty housewares like these green glasses, this coffee/tea mug and a little bowl for a little bit of chocolate. These little cakes were a nice break from the super rich selections we've had the rest of the month. In the recipe Dorie calls for a bundt or Kugelhopf pan but I used a muffin pan and mini-loaf pans to make sharing easier. I also topped them with a little toasted coconut. I didn't find the coconut flavor very prominent, I think maybe the batter could have used another kick of coconut. It's still a good cake just not really coconut-y. Thank you to Carmen of Carmen Cooks for this week's selection. Intense! These are a deliciously intense brownie/cheesecake hybrid. The bottom is brownie and it's topped with a thick, rich layer of cheesecake that has been sprinkled with chocolate chips, which sink to the middle during baking creating an almost solid middle layer of chocolate in between the brownie and cheesecake. A half-dozen eggs are needed for this craziness but it's well worth it. The recipe is from the Sweet Melissa cookbook and if you don't have it and love to bake you need it. I sent these with Doug last Monday for his project team and they really liked them. They were perfect with a cup of dark roast coffee. It's time to plant again already! Time has flown by, of course living in Zone 7 is helpful too. Two weekends ago I cleared out all the unmulched leaves from the garden beds (and stuck them in the compost pile) and planted Dwarf Gray Sugar Snap Peas, Rainbow Swiss Chard and Scarlett Nantes Carrots, all from Seed Savers. Our temps dipped a little low last week (not at or below freezing though) so there wasn't a lot of activity out there. However I did discover our neighbor's outside cat was using my raised beds as giant litterboxes. Now I love animals and I have three inside cats myself but I wanted to murder my neighbor's cat, not only does it poo in my garden but it terrorizes my backyard birds too. This weekend I fixed the poo problem by getting a roll of chicken wire from Lowe's and covering each bed with wire. It's actually something I usually do anyway until the plants get too big as a means of discouraging the squirrels from digging up the newly planted seeds. Since it was a little warmer this past week the peas finally sprouted and I saw teeny, tiny beginnings of the Swiss Chard. I've never successfully harvested peas, they've usually succumbed early to fusarium wilt but I'm hopeful this year. I've also never planted Swiss Chard so I hope to have a nice crop. As far as carrots go, the first year of my garden I did have a small harvest but last year my seeds never germinated. I've planted a new variety and maybe I'll get another carrot harvest. My parsley and chocolate mint, which I planted two years ago, survived the winter again, new growth is starting and I'm sure once the temps warm up and stabilize the mint will take over the herb bed again, it's practically invasive. Our back yard is beginning to look a lot like spring too, the quince is in full bloom, as is the bridal wreath (Spiraea prunifolia) and a few narcissus, lovely! I did not know I could love a non-chocolate cookie so much but holy hell these are good. I almost didn't make them because I went to three stores without finding any dulce de leche and I was too busy to try to make my own. As a last resort I sent my husband to a Kroger near his work and he found it. These are fabulous, cookies are soft and cakey and make a sweet little sandwich with a thick layer of dulce de leche in the middle. 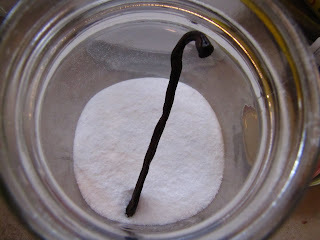 The only alterations I made were to use a teaspoon of sea salt instead of 1/4 teaspoon of regular salt. Thanks to Jodie of Beansy Loves Cake for such a good selection (recipe is on her blog). I'm going to start stockpiling dulce de leche so I can make these more often. I spent part of the weekend setting up and playing with my new toy... It's super sweet to have a laptop now, our desktop is going on eight years old and is really showing it's wear. The color settings are screwed up on it so I could never tell if my pictures were too dark/too light, not clear enough, etc. The new computer is a Sony Vaio and the screen is so clear and bright and generally fabulous. I spent a couple of frustrating hours trying to connect to our wireless network Saturday night before calling Comcast to learn our wireless settings weren't compatible with the laptop's operating system (Windows 7). Luckily (and surprisingly) Comcast was able to help me change our settings and get the problem fixed in less than ten minutes. I was dreading trying to relocate my iTunes library but was again pleasantly surprised to find an easy solution. iTunes now has a Home Sharing option so I was able to copy my music library from the desktop to the laptop painlessly via our wireless network and by making a few clicks in my iTunes account. Oh and here's something else I've been wasting time watching online, although it's not as potentially brain-rotting as anything on MTV might be. I bake at least twice a week, if not more. It's like a crazy addiction for me, plus I have several groups of people to share it with. On Thursdays Doug has a game night and I try to send baked goods every week. They're always very appreciative and Doug usually comes home with an empty cookie platter. This past week I got nothing but compliments on these cookies. The recipe is from the Sweet Melissa Baking book and it's a pretty simple chocolate slice and bake cookie. What makes this cookie special is the addition of dried cherries and chopped bits of melty semi-sweet chocolate, like little Black Forest-esque cookie bites, yum. 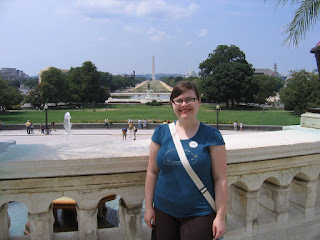 Several summers ago Doug and I took a trip to Washington D.C. We were there for a week, staying in a cute little hotel in Foggy Bottom, walking to the White House just hours after our plane landed and taking the Metro everywhere. It was a nice trip except we went in early August and it was hot, hot, hot and there were families and children everywhere because they were all trying to fit in their last-minute summer vacations. I have nothing against families or children but it made visiting the Smithsonian museums a lot more crowded. Besides going to the International Spy Museum, another highlight of our trip was going to Teasim, a little place we went for lunch twice. They sold packages of their house-made Salty Oats cookies, crumbly textured oatmeal cookies with a sprinkling of sea salt on top, I ate SO many. I've often thought about those cookies, especially now since salty/sweet things are so popular. 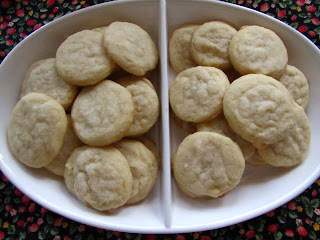 Some Google-ing lead me to a recipe that claimed to be very similar to those cookies I loved. However the recipe had rice flour in it, which I didn't have in the pantry. So instead, I found a recipe that has similarities, but it's more chewy than crumbly, as well as being studded with dried cranberries. These were great and the recipe made plenty for me to share with others, but it still isn't quite the Teasim Salty Oat cookie, I'll have to get the rice flour for those. Delicious! I say it a lot but it's always true. 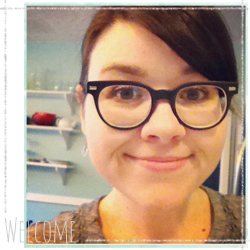 This week's selection came from Rachelle of Mommy? I'm Hungry! I made the tart crust plain, no nuts, only because I had already mixed everything together by the time I remembered. 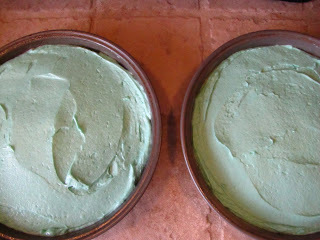 I doubled the tart dough because my tart pan is large and I never seem to have enough dough. 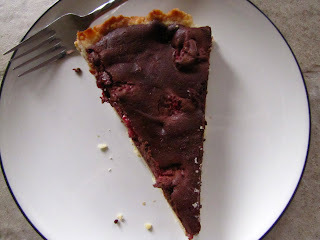 The ganache part was simple to make and assembling the entire tart was quick and easy. 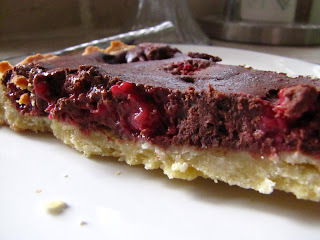 I loved the combination of chocolate and raspberries against the contrast of the buttery tart crust, yum! I did plenty of things this weekend that warranted taking pictures, but did I take any? Nooooo. Bad blogger. Friday afternoon I got a haircut with bangs! 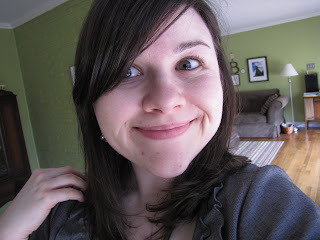 I have a big round face and across the forehead bangs make my head look even rounder but side bangs seem to work. Friday night I volunteered to stuff envelopes for a few hours at WEVL and then planned to go to dinner. Unfortunately (and due to my own stupidity), I had only eaten an energy bar and a fruit smoothie over the course of the entire day so by 7:30pm I developed a mammoth headache. So Doug and I aborted our dinner plans, he brought me food and I curled up in a ball in bed until Saturday morning. Saturday we had breakfast at Blue Plate and then did a little shopping. I caught the end of an interview on NPR with the author of this book. It peaked my curiosity because the author teaches at the University of Memphis. 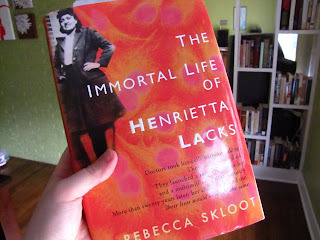 After Doug finished buying fly fishing supplies we drove over to Davis-Kidd and I picked up a copy of The Immortal Life of Henrietta Lacks. I'm halfway through it right now and it's a really engaging story. Especially considering my recent interest in cytology and microbiology. The chapters alternate between telling the story of Henrietta Lacks and the story of an immortal cell line taken from Mrs. Lack's (without her consent). I haven't been reading as much as I have in the past, it's harder when your hands want to knit instead of hold a book and audio-books just aren't the same. Saturday night we saw the Memphis Roller Derby double-header with friends, Sunday morning we slept later than we meant to (stupid Daylight Savings Time) I had brunch with friends at the Hi-Tone (really good), went on a trip to Super Target and then had my brother and sister-in-law over for dinner. The Memphis weather was a little less than spring-like but I'm enjoying the cool weather while it lasts. Cookies made recently for the husband and his Thursday night group (and some for my knitting friends too). 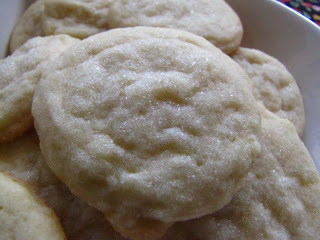 Vanilla Bean Sugar Cookies (recipe here) Made with vanilla bean sugar (sugar + vanilla bean pod in a jar for two weeks). Lovely little cookie. 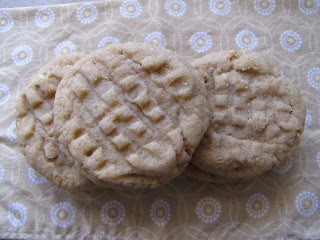 Peanut Butter cookies from Dorie's book. 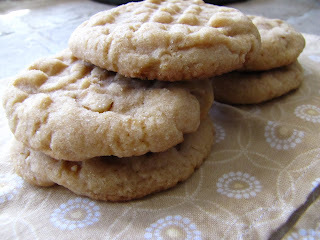 I'm normally not a huge fan of peanut butter cookie but these were delicious. I love baking cookbooks, I haven't counted how many I have but it's most of my cookbook library. 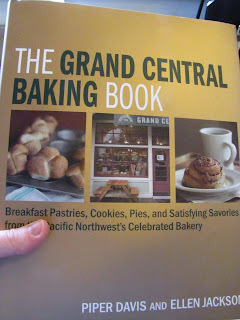 I heard about the Grand Central Baking Book via a few other blogs I frequent. Somehow in my trips to Portland and Seattle I managed to not visit any GCB location so I really had no clue about them. But I ordered the cookbook and it came last Thursday and I started pawing through it immediately making my weekend baking plans. One of the first recipes I found was the Jammers recipe. 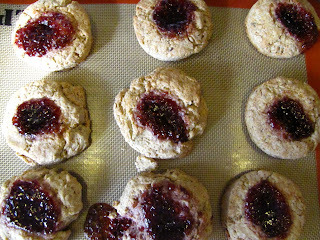 Jammers are essentially biscuits filled with jam and then baked. Similar to the idea behind thumbprints (like yesterday's). 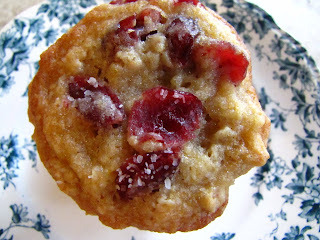 They reminded me of a muffin I had at Macrina Bakery in Seattle. I toyed with the recipe a little, subbing some whole wheat flour for some of the white flour and added about 1/4 cup of ground flax seed. 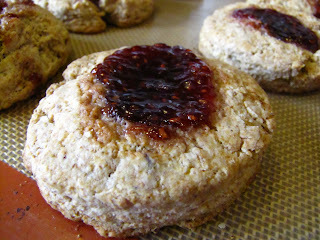 They were delicious, I used Bonne Maman raspberry preserves for the jam. 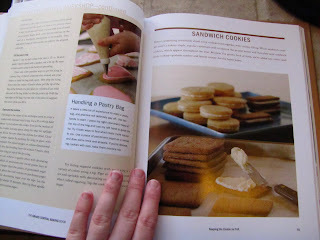 I can't wait to make more things from the GCB cookbook, there are so many recipes packed into the book. The sandwich cookies look especially tempting and I bet they travel well too. This week's selection came from Mike of Ugly Food Dude. 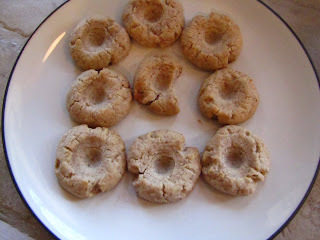 A fairly simple thumbprint cookie that uses nuts. The recipe calls for hazelnuts and raspberry jam but Dorie says you can play around with the recipe to suit you. 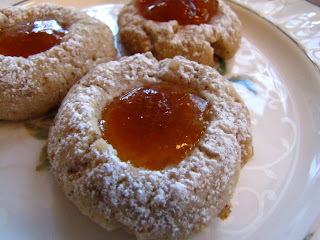 I used almonds and apricot jam for these, a great combination I think. 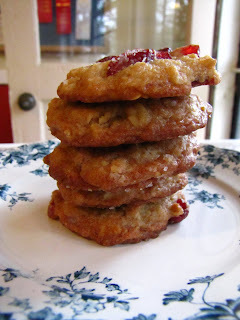 (yes I took a bite out of that cookie in the middle, I had to make sure it tasted okay...) They turned out well, buttery little bites with a tiny pool of jam, tasty! Thanks Mike! 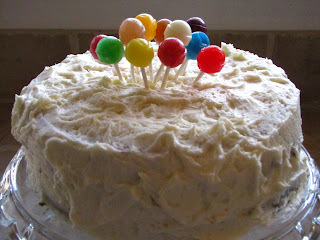 In honor of an Oscar gathering some friends had last night, I made the 7-Up "Up" Cake from Cakespy/Serious Eats. I'm enamored with Jessie Oleson's delicious illustrations and her love of all things baked and her recommendations of Seattle sweet spots has been invaluable to me when I've visited. She did a series of Oscar-themed desserts for Serious Eats and they were all very fun. The 7-Up cake was an artery hardener for sure, 5 sticks of butter, 3 cups of sugar (not including the frosting) and 5 eggs! Also, interestingly enough the directions called for creaming the butter and sugar together for 20, yes 20, minutes. 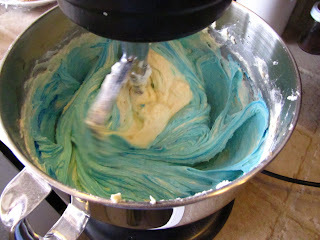 I've never been so happy to own a stand mixer. There was also 3/4 of a cup of 7-Up in the cake, but the cake didn't taste much like 7-Up, one person said it tasted like cotton candy. 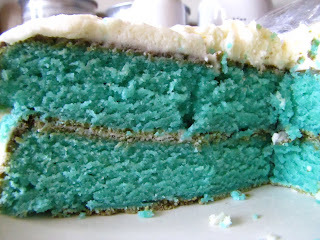 I used a tad too much blue food coloring for the batter so the cake was more a BRIGHT blue than a soft sky blue. 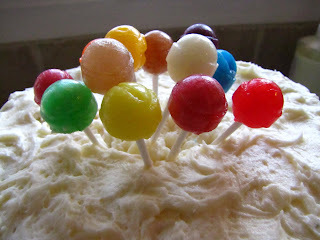 For the balloons I used little Dum-Dum suckers and I left off the coconut (I never know what the crowd consensus is on coconut). It turned out cute and waaay moist. As you can imagine my grand plan for knitting a sweater a month has fallen flat. Not surprising however, I guess I'm a really sloooow knitter. 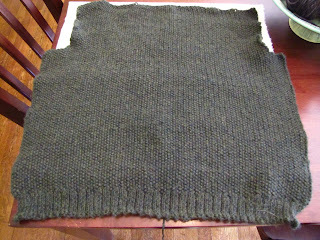 Since January 31 I've been working (off and on) on the Minimalist Sweater in Berroco Vintage, which is a washable acrylic/wool blend. 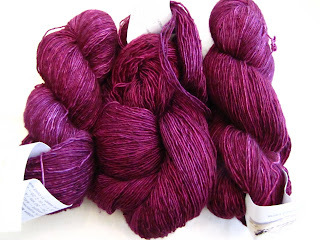 It's going to be my first seamed sweater and it's knit in miles and miles and miles of seed stitch. I just cast off the back piece Monday night. Now I'm working on the right front panel. 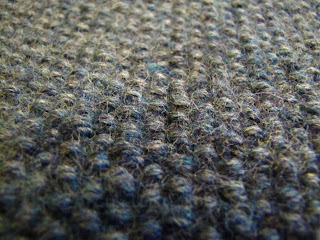 Besides the right front panel I still have to knit the left front panel, two sleeves and then seam the sucker together, yipes. 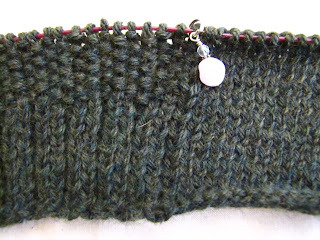 I still love the seed stitch, it looks so nice knit up. 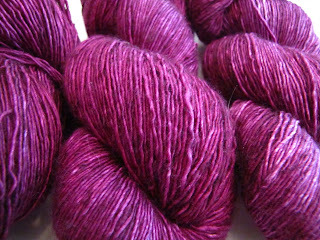 Saturday I went to Jo-Ann to get fabric and saw some of the new Debbie Stoller yarn she's doing with Red Heart. I grabbed two balls for my stash, Espresso and Fern. Her colors are bright and the yarn is not the normal squeaky Red Heart blend. 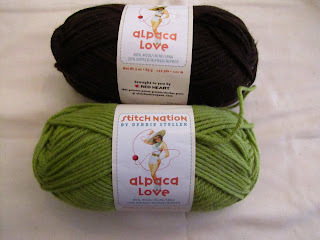 I got the Alpaca Love, which is a blend of wool and alpaca, there's also a bamboo blend and a single-ply wool too. I think those two colors would be sweet in a sweater or hat for a little one.